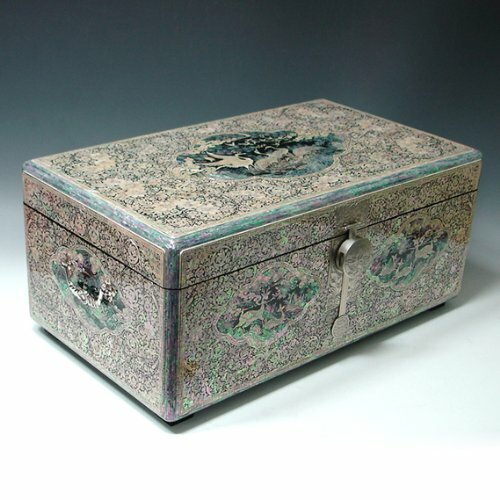 This exquisite Korean wedding box (Ham) is elegantly decorated with mother of pearl long life symbols design (Sipjangsaeng). The specially handcrafted flying crane design knob made of cupro-nickel adds beautiful panache to this unique wedding box. According to tradition, before the wedding the groom's family sends a box containing Chaedan (wedding presents sent by the groom's family for the bride's) and Honseo (a written marriage oath to the family of his bride). This box is called ham. The Honseo, wrapped in black silk, specifies the name of the sender (groom and his father) and expresses groom's gratitude to bride's parents for the marriage. The wife is to keep Honseo with her forever, having it buried with her when she died. Chaedan includes red and blue fabrics used to make clothing. The blue fabrics are wrapped with red threads, while the red fabrics with blue threads. The two colors represent the philosophy of Eum Yang (Yin Yang). Ham is delivered by a small group of close friends of the groom. The bride's family would have a small party for the group, offering them food and drink for their efforts. The ceremony of delivering the Ham has evolved into a major event for friends of the groom, with the bearers "selling" the contents of Ham to the bride's parents. Once the ham arrives at the bride's house, it is placed atop a rice-cake steamer in which bongchaetteok (steamed glutinous rice cake sprinkled with red bean powder) are prepared. At the center of the top layer, seven jujubes are placed in a radiant shape. Bongchaetteok is prepared to wish the couple a relationship that is as fast and tenacious as the glutinous rice that is made from. The rice cake is shaped in two layers to symbolize a couple. The red beans are to ward off misfortune whereas the seven jujubes represent seven sons to wish the couple many sons and prosperity.